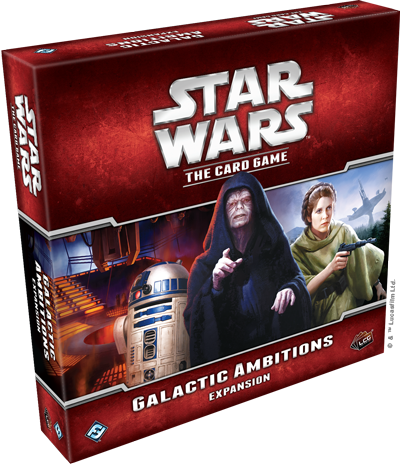 Fantasy Flight Games is proud to announce Galactic Ambitions, the fifth deluxe expansion for Star Wars™: The Card Game! Two great powers struggle for the fate of the galaxy across the Star Wars saga. On one side, you find the fledgling Rebel Alliance, led by a few brave politicians and desperately fighting for the hearts and minds of people on countless planets. The Rebels stand against the tyranny of the Empire and spread hopes of freedom and justice across worlds choking on fear of military reprisal. Opposing the Rebels stands two shadowy individuals with the might of the Galactic Empire behind them. From his palace on Imperial Center, the Sith Lord publicly known as Emperor Palpatine rules the galaxy with the might of the Imperial military and the power of his apprentice, Darth Vader. Though they spent centuries waiting in the shadows, the Sith have risen to rule the galaxy, and they will crush the nascent Rebel Alliance by any means necessary. Galactic Ambitions pits these two powers against each other in a struggle for the galaxy itself. 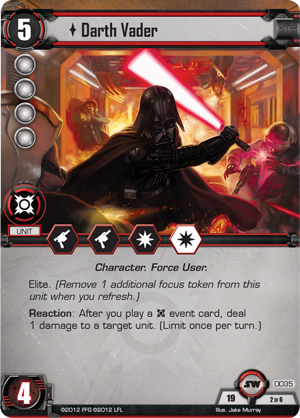 Like previous deluxe expansions, the twenty-six new objective sets included in Galactic Ambitions fix the spotlight on two factions—the Sith and the Rebel Alliance—but every faction receives cards that push your decks in new directions. Here, you’ll find an assortment of iconic characters to include in your decks, such as new versions of Darth Vader, Emperor Palpatine, Leia Organa, and Mon Mothma. 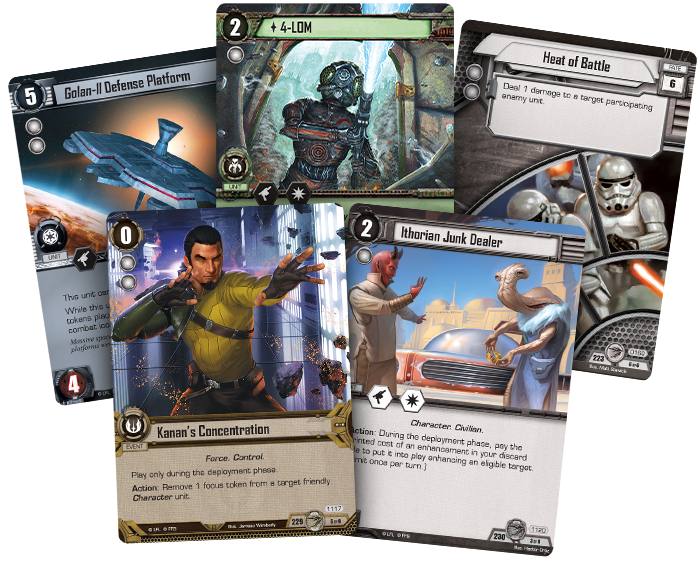 Other characters make an appearance in Star Wars: The Card Game for the first time, including Kanan Jarrus and The Inquisitor from Star Wars: Rebels, as well as General Jan Dodonna. 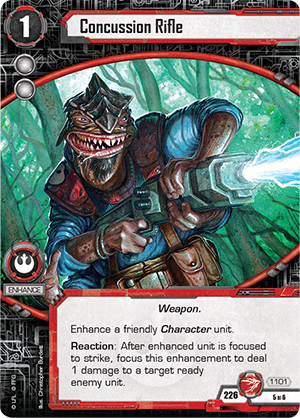 Whether you’re fighting to free the galaxy or to squelch any trace of resistance, Galactic Ambitions offers new strategies and cards to support new decktypes. 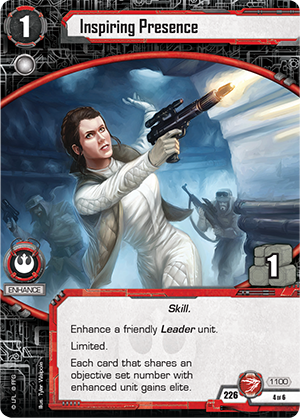 Even from the days of the Core Set, the Rebel Alliance has relied upon the prowess of its Leaders to support its other units and spearhead assaults against the dark side. In Galactic Ambitions, you’ll find a new focus on your Leaders themselves. 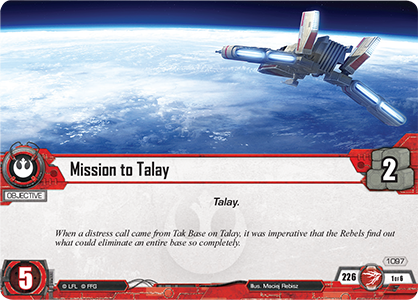 One of the objective sets that primarily contributes to this new focus is Mission to Talay (Galactic Ambitions, 1097). 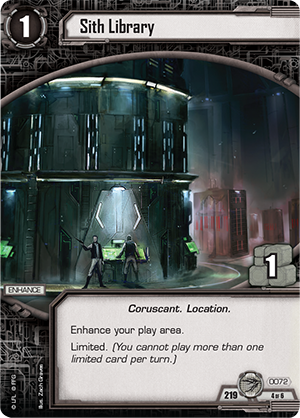 On its own, the objective only offers two resources, but even this relatively common objective takes on new significance when combined with some of the other cards in this objective set. The set begins with a new version of an iconic Rebel Leader, Mon Mothma (Galactic Ambitions, 1098). 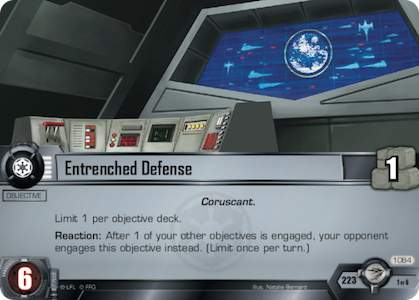 Mon Mothma can participate in a fight if necessary, using a valuable tactics icon to clear the way for your attackers or neutralize an enemy attack, but her best usage almost always lies in planning assaults from behind the scenes. 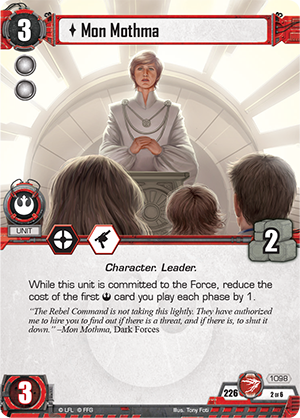 Mon Mothma provides two resources to build your resource base, but more importantly, she has an ability that reads, “While this unit is committed to the Force, reduce the cost of the first Rebel card you play each phase by 1.” Obviously, this represents a huge economic advantage, and importantly, this deduction is not limited to a certain phase. That means you can discount the first Rebel unit you play in the deployment phase, as well as the first Rebel event you play in any other phase. Many Rebel events such as Infiltration (Join Us or Die, 575) even become free to play with Mon Mothma! Even as she sits and plans behind the scenes, you can continue to make Mon Mothma relevant with Inspiring Presence (Galactic Ambitions, 1100). This enhancement can be attached to any friendly Leader unit, and every card that shares an objective set number with the enhanced unit gains elite! By giving the elite keyword to a segment of your deck, you can quickly decrease the power of enemy tactics and allow two-resource objectives like Mission to Talay to refresh much more quickly. Even if Mon Mothma never enters an engagement, she can still have a powerful effect when combined with Inspiring Presence. If Mon Mothma is excellent at organizing events behind the scenes, you also need warriors willing to fight on the front lines. To that end, this set also includes a Rebel version of Kyle Katarn (Galactic Ambitions, 1099). At this point, Kyle Katarn has not yet tapped into the full potential of his Force powers, but he’s still a dangerous opponent. 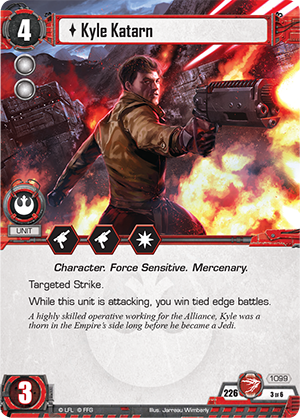 He bears the targeted strike keyword to pick off enemy units, and while Kyle Katarn is attacking, you win all tied edge battles, making him even more dangerous for the dark side to oppose in combat. Kyle Katarn becomes even more dangerous if you equip him with a Concussion Rifle (Galactic Ambitions, 1101). This Weapon can greatly increase your damage potential—whenever the enhanced unit is focused to strike, you can focus the Concussion Rifle to deal a damage to any ready enemy unit. When combined with Kyle Katarn’s targeted strike, the amount of damage you deal in a single engagement may become insurmountable for the dark side. Finally, you may call upon your Leaders to search for new heroes with Rebel for Hire (Galactic Ambitions, 1102). This event allows you to search your deck for any card that shares an objective set number with one of your Leaders and add that card to your hand! 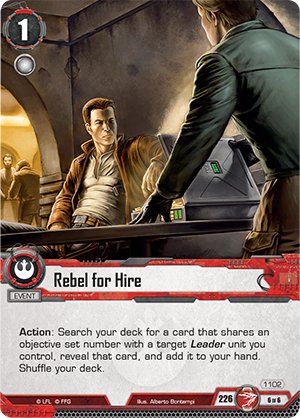 The more Leaders you have in play, the more of your deck you have on-call access to, making Rebel for Hire one of the most potent deck searching effects in the game. Even as Mon Mothma and Kyle Katarn plan their missions and carry out important strikes against enemy objectives, Emperor Palpatine watches from the shadows, silently plotting and waiting. 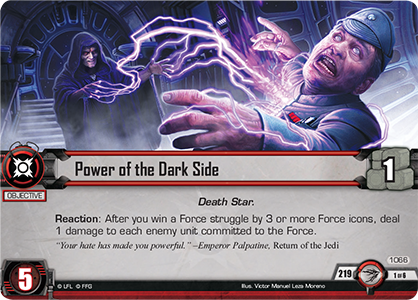 You can wield the power of the dark side with a new version of Emperor Palpatine introduced in this deluxe expansion. 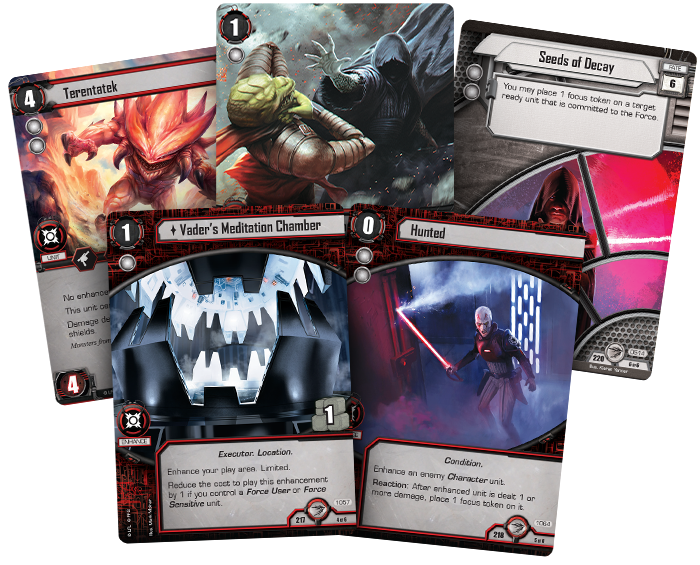 The Sith excel at locking down their opponents and winning the Force struggle in Star Wars: The Card Game, and Galactic Ambitions expands both of these aspects with the new version of Emperor Palpatine (Galactic Ambitions, 1067). This version of the Emperor still retains the elite keyword, but he has gained a different line-up of combat icons. Although he can still attack or lock down enemies with tactics icons, the Emperor now boasts two unit damage combat icons that he can use to kill opposing enemy units if necessary. 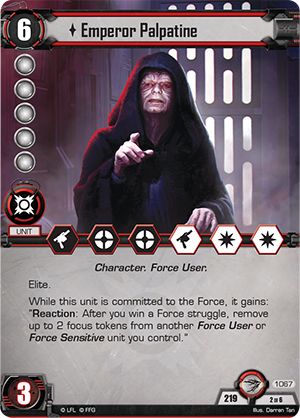 More often, though, you may choose to leave Emperor Palpatine committed to the Force and lurking in the shadows, because while the Emperor is committed to the Force and you win a Force struggle, you can remove up to two focus tokens from another Force User or Force Sensitive unit you control. 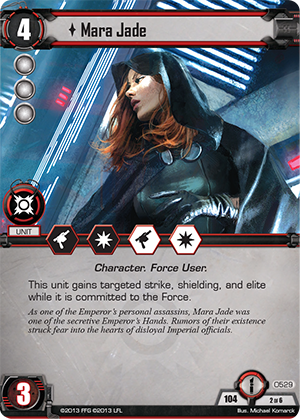 By refreshing powerful units like Mara Jade (Lure of the Dark Side, 529) and Darth Vader (Core Set, 35), your dark side can be more aggressive than ever. Naturally, the Emperor is expensive to play, but a Sith Library (Galactic Ambitions, 72) in this set helps to accelerate your resources. 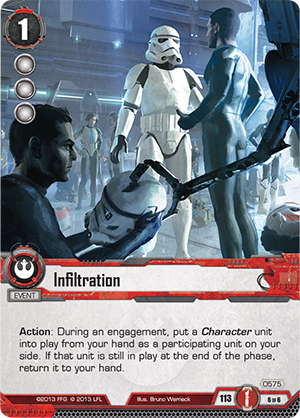 Other cards grant you additional rewards for focusing on the Force struggle. 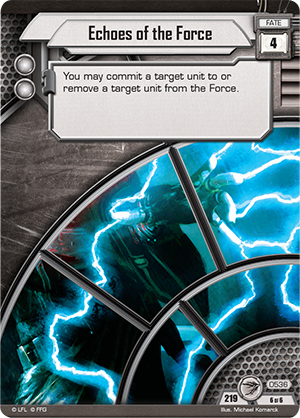 The objective of this set, Power of the Dark Side (Galactic Ambitions, 1066), lets you deal a damage to each enemy unit committed to the Force whenever you win a Force struggle by three or more Force icons, steadily whittling away at the light side’s Force-committed units until they crumble beneath your power. 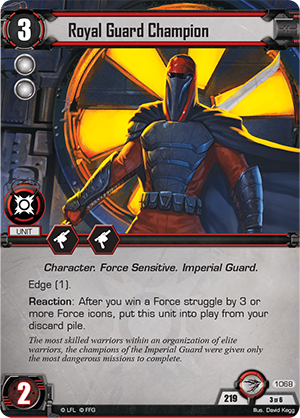 You may also play the Royal Guard Champion (Galactic Ambitions, 1068), a powerful defender with edge (1) who can return to play from your discard pile whenever you win the Force struggle by at least three Force icons. You can further demonstrate your superiority over the Force with the event contained in this objective set: Force Manipulation (Galactic Ambitions, 1069). 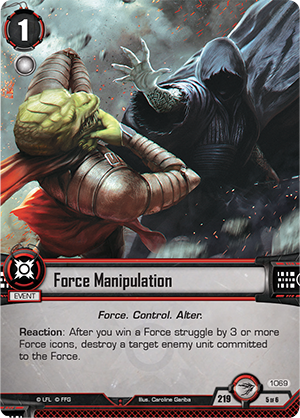 After you win the Force struggle by at least three Force icons, you can play Force Manipulation to instantly destroy a chosen enemy unit committed to the Force! You may even combine this with Echoes of the Force (Galactic Ambitions, 536) to commit an enemy to the Force and destroy him. Even outside the Sith and the Rebel Alliance, everyone is affected by the tumult of the Galactic Civil War. 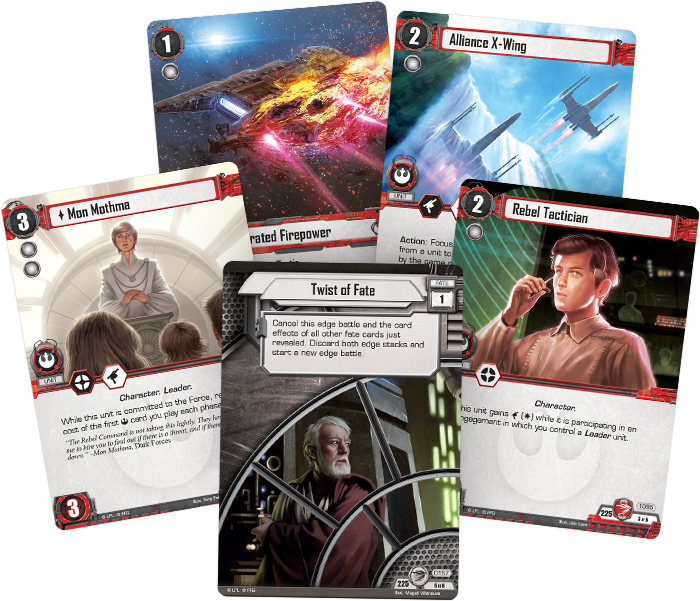 Although they’re out of the spotlight, each of the other four factions in Star Wars: The Card Game gains a new objective set to expand their options. 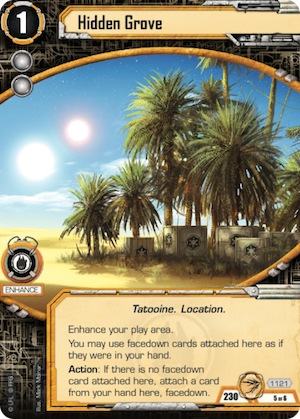 The Smugglers and Spies may hide contraband goods in a Hidden Grove (Galactic Ambitions, 1121) where your cards can remain secret from the Empire. 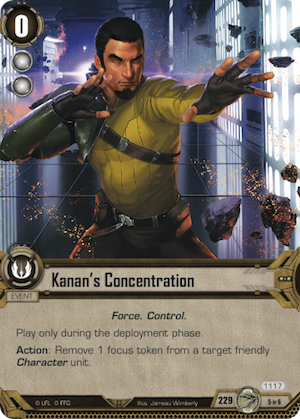 The Jedi faction gains a new addition in the person of Kanan Jarrus, and by playing Kanan's Concentration (Galactic Ambitions, 1117), you can negate the effects of enemy tactics icons or use a single unit for both resources and combat. The multiple factions of the dark side are also not idle as the war for supremacy rages around them. 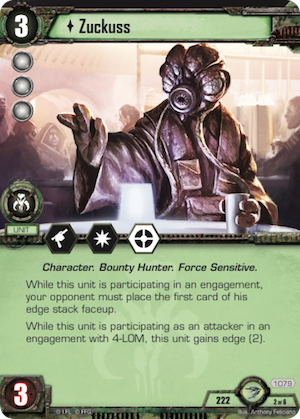 Bounty hunters like Zuckuss (Galactic Ambitions, 1079) and 4-LOM make their living on the periphery of the combat, and they excel at capturing units who have a bounty placed on their heads by Imperial authorities. Meanwhile, the Imperial Navy works to establish an Entrenched Defense (Galactic Ambitions, 1084) for their objectives, preventing the light side from outracing you on the road to victory. No matter which side and faction you play, Galactic Ambitions expands your horizons. The galaxy is caught between dark and light, between the secretive machinations of the Sith and the valiant freedom-fighters of the Rebel Alliance. With this deluxe expansion, you choose which side emerges victorious. Look for Galactic Ambitions at your local retailer in the second quarter of 2016!